What if Income Didn't Matter for Financial Independence? In other words, you have also 2 ways to be financially independent. Either you try to make so much money that you cover all needs, no matter how excessive they are. Or you can work on your wants and needs and keep them so low, that you don't need to worry too much about the amount of money you're making. It sounds so obvious, but I believe that everyone from companies with their advertising to parents with their job recommendations make us focus on way number 1. At first sight, it might seem easier to just try to earn amount XYZ in order to reach financial independence. 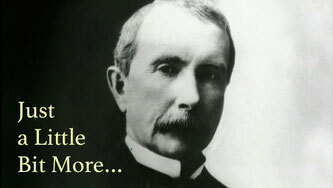 But considering that even Rockefeller replied to the question "how much money is enough? ", with the answer "just a little bit more", it seems difficult to ever reach an amount that does actually leave us satisfied. The reason is simple: the more we earn, the more we get used to conveniences, status and luxury. What is more, the more we buy, the more money we need to maintain our property. Cars need to be fixed, houses need to be painted and gym memberships need to be paid. So how to make way number 2 work for us? The first step is probably to reduce reoccurring cost like rent, loans and membership fees. "Own a small house" as Sukadev puts it nicely in one of the Yoga Vidya podcast episodes. This way, there will be less struggle to cover our daily treats (restaurant visits, cinema,...) or big adventures (traveling) - and those are things that do make us feel more independent, that's for sure. The other big aspect is the location where we live. Personally, I love London and after my M.Sc. studies there, I never wanted to live anywhere else again. But the cost of living there is just so high that I would need to take a job that I don't want to take. So I decided to leave. In the bottom line, I started to understand that being financially independent doesn't necessarily mean to take a crazy banking job or anything like that. It's more about finding your right balance and rethinking your needs, so that they match the professional steps that you want to take. "Either you try to make so much money that you cover all needs, no matter how excessive they are. Or you can work on your wants and needs and keep them so low, that you don't need to worry too much about the amount of money you're making." Learning to live with less. We seem to be doing exactly the opposite. Greetings! Very useful advice in this particular article! It is the little changes which will make the greatest changes. Many thanks for sharing!